“Kiloran” is as mysterious as Brigadoon. For one, it’s a fictional island played by Colonsay in I Know Where I’m Going! Our leading lady, Miss Webster, simply cannot get across to the distant isle despite her sincerest efforts. Powell and Pressburger’s Scottish tale of an English lady due to be married to a rich industrialist is set in the beautiful Highlands of the north and tells a tale of what true wealth may be. I Know Where I’m Going!, screened as part of the BFI’s ‘Love’ season, adores the history of Scotland and the vast beauty on the Isle of Mull. To tell an enchanting story of plans scuppered when meeting your true love, I Know Where I’m Going! uses the lore, traditions and luscious landscape to frame an adorable tale with hidden depths that remain relevant today. Separating I Know Where I’m Going! 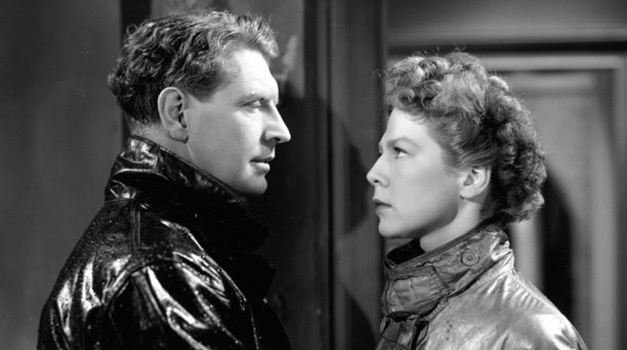 from the pack is its brash and bold Joan Webster (Wendy Hiller), setting the pace from the get-go. A narrator explains how she knew where she was going as baby, child and teen. When she meets her Father at an upper-class restaurant, she reveals her plans for the future: She is to marry the heir to business empire, Consolidated Chemical Industries. They are due to be married in Kiloran and, though she’s never visited the area, (and without cause for concern) that is where she’ll be going next. Her father reluctantly sees her off at the station and she dreams of what she is marrying into. But, arriving at Carsaig, she is forced to change her plans. 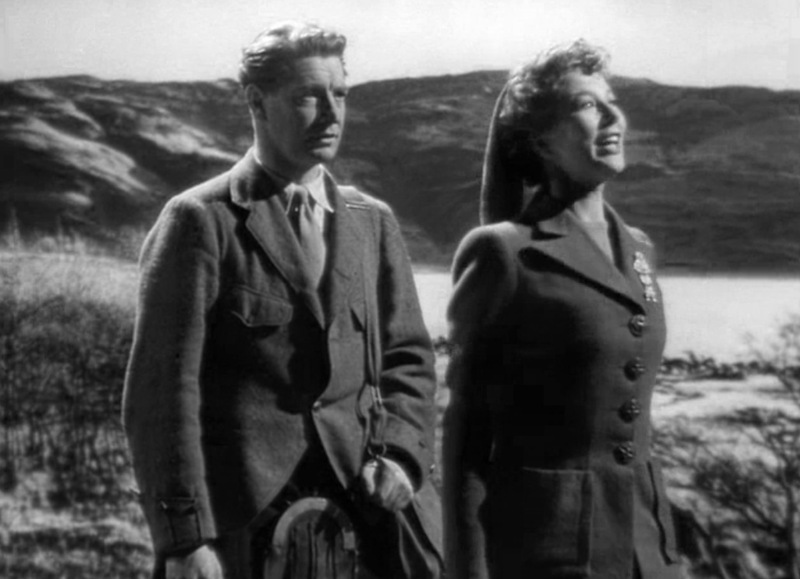 Upon meeting Torquil MacNeil (Roger Livesey), her defiant and purposeful intentions are rattled, while her wishes and desperation to get to the island only falls onto deaf ears. To make the situation sticky, the adorable town folk all welcome her with open arms too. Powerful Catriona (Pamela Brown) and her scruffy dogs only serve to inspire her, though she won’t admit it. Expert falconer, Colonel Barnstaple (Captain C.W.R. Knight), seems to be a crazy, loveable uncle to everyone with his passionate interests and jocular tales of foxes and sheep. Even a passing conversation on a bus with local men seems to challenge her assumed interests. Joan can’t deny the appeal of this land. Her husband-to-be is Sir Robert Bellinger. Almost as mysterious as Kiloran, his plans to build a swimming pool and catch salmon (to sell on for profit) hints at a business-like mind that is at odds with the community surrounding him. Initially Bellinger is the ideal man for Joan but the kindness of strangers chip away at her hard exterior and her instinctive pull to the natural calling of the Highlands wins out. The magnificent transitions and use of models all heighten this sense of expectation. In one shot of the train passing through Scotland, it appears to show enormous tartan sheets draped over the hillsides, almost as if she is dreaming of the fantasy ahead of her rather the reality of rural life – something the weather is intent on proving. The unexpected and unplanned rain, gail and hail, all dictate her future, as it dictates those in the town. The hotel and the cèilidh’s are all affected by the weather and it transforms her too. Interestingly, the conservative Englishness versus the “money’s not everything” mantra of Scotland seems to be exceptionally relevant in our current SNP versus Tory conflict. Suffice to say, love and heartfelt truth is what rues the day. With three pipers leading the way as Joan proudly walks to meet her man, we should only be so lucky if such sincere intentions are championed in cinema today.